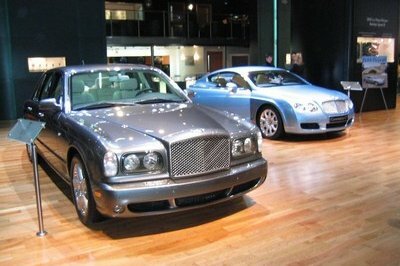 Introduced in 2010 as a replacement for the 11-year-old Arnage, the Mulsanne is currently Bentley’s range-topping sedan, sitting above the Continental Flying Spur in the lineup. The limousine received an equipment update in 2013 and various special-edition versions, including a performance-oriented Speed model until 2016, when a mid-cycle facelift was launched. Come 2017 and Bentley introduced the Mulsanne Hallmark Series by Mulliner, arguably the most exquisite limited-edition based on the full-size sedan yet. Described as a highly exclusive model "inspired by the finest precious metals and luxury materials used by the very best jewellers," the Hallmark Series is available across the entire Mulsanne range, meaning it can be ordered for the extended wheelbase model too. Marketed as the "ultimate statement of luxury" in the Bentley family, the limited-edition model is quite the flamboyant proposition, being available in two-tone paint finishes and with either silver or gold highlights. A bit too flashy if you ask me, but I’m sure this model will be extremely popular in the Middle East where silver an gold emblems are a big thing. The Mulsanne Hallmark Series by Mulliner makes its official debut at the 2017 Geneva Motor Show, so make sure you stick around for photos from the event. Continue reading to learn more about the Mulsanne Hallmark Series by Mulliner. Available in either solid silver or finished in carat-gold plating, the "Flying B" mascot is engraved on both sides. 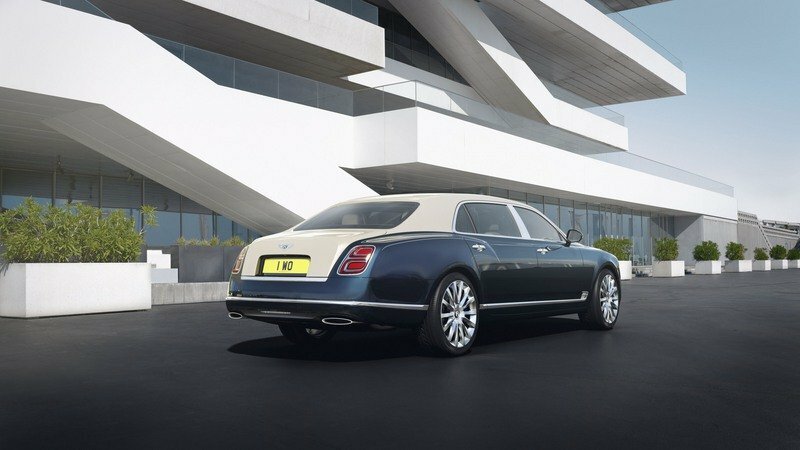 Although the exterior features that come with Mulliner limited-edition are rather subtle, it becomes obvious that this is not a regular Mulsanne as soon as you look at the "Flying B" mascot on the front radiator. Available in either solid silver or finished in carat-gold plating, the mascot is engraved with "Commissioned" on one side and "By Mulliner" on the other. The next way to tell this version apart from the standard Mulsanne is to look for a matching fine line running the length of the body. 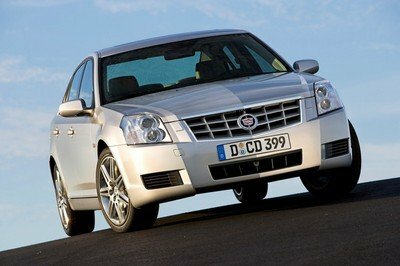 Also available in silver or gold, the thin line starts from the outer headlamps and runs into the rear doors. From there, a different line ascends over the rear haunches and runs almost into the taillights. Although very subtle, the line adds a bit of elegance when paired with darker body paints. Speaking of which, the Hallmark Series can be ordered in either two- or single-tone finishes. The former likely brings together just about any color combination available in Bentley’s palette. For instance, the carmaker showcased a gray car with blue top and gold highlights and a metallic blue one with a cream-like beige top and silver highlights. I like the second one better because it has a vintage feel to it, but the combinations available are basically endless. Rounding off the exterior design is a set of imposing 21-inch, polished alloy wheels and distinct Mulliner grille. All four seats are trimmed in contrasting hides, combining gray with either cream and light brown. The silver/gold theme continues inside, where all four seats are trimmed in contrasting hides, combining gray with either cream and light brown, both seemingly selected to mimic the silver and gold detailing of the exterior. The rear seats also have Alcantara cushions matching the color of the front seats. 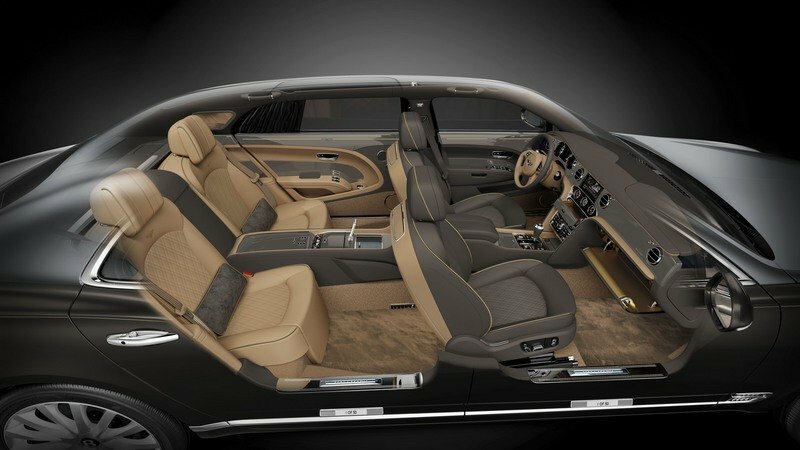 Every upholstery element sports silver or gold embroidery, stitching, and piping, while the dashboard fascia has a silver or gold overlay with a "Mulliner" inscription, as well as solid silver or gold-plated inlay strips on all door waistrails. Bespoke metallic silver or gold highlights the Hidden Delights storage spaces, a feature inspired by the tailoring of Savile Row suits. Mulliner also crafted special umbrellas and illuminated treadplates featuring model-specific numbers (numbered "1 of 50"). 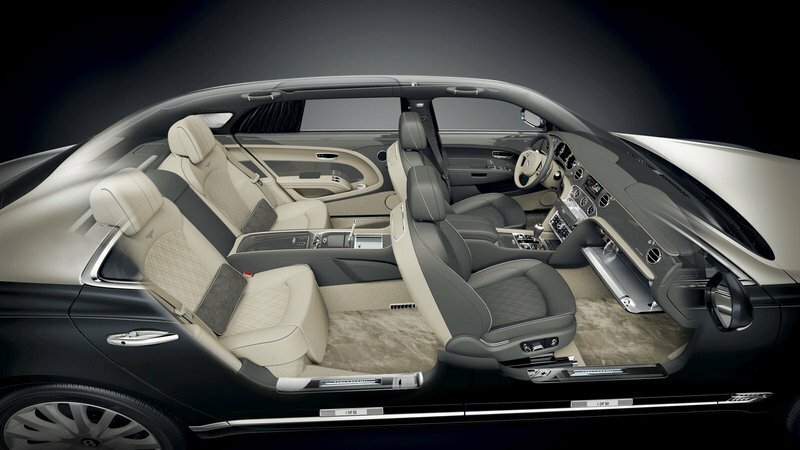 An optional Mulliner cocktail cabinet is also offered, but Bentley has yet to release specific information or pricing. 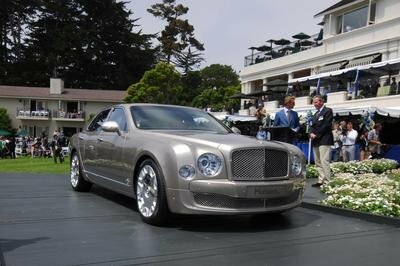 The Mulsanne is able to hit 60 mph in a scant 5.1 seconds on its way to a top speed of 184 mph. Bentley had nothing to say about the drivetrain, so it’s safe to assume that nothing changes under the hood. 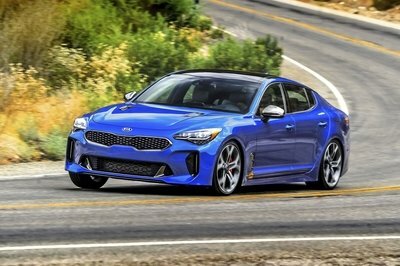 As you may remember, the 2017 facelift didn’t bring any news either, so the Hallmark Series is "stuck" with the same 6.75-liter V-8 rated at 505 horsepower and a massive 752 pound-feet of torque. There’s no need to be disappointed though, as the Mulsanne is able to hit 60 mph in a scant 5.1 seconds on its way to a top speed of 184 mph. 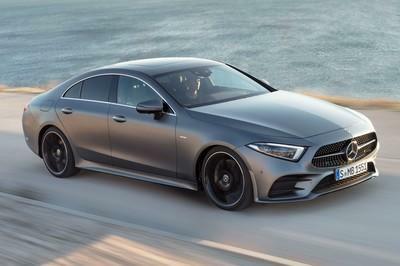 The sedan uses the same eight-speed ZF automatic transmission as before, but employs new, active engine mounts and air suspension system with Continuous Damping Control. Bentley usually doesn’t release pricing for Mulliner models, which is a matter of contacting the firm directly, so it’s not surprising that the Hallmark Series doesn’t come with an official sticker. However, with the standard Mulsanne retailing from around $300,000, it’s safe to assume that this limited-edition model, which will be built in only 50 units, probably costs anywhere between $350,000 to $400,000 before options. Read our full review on the Bentley Mulsanne here. 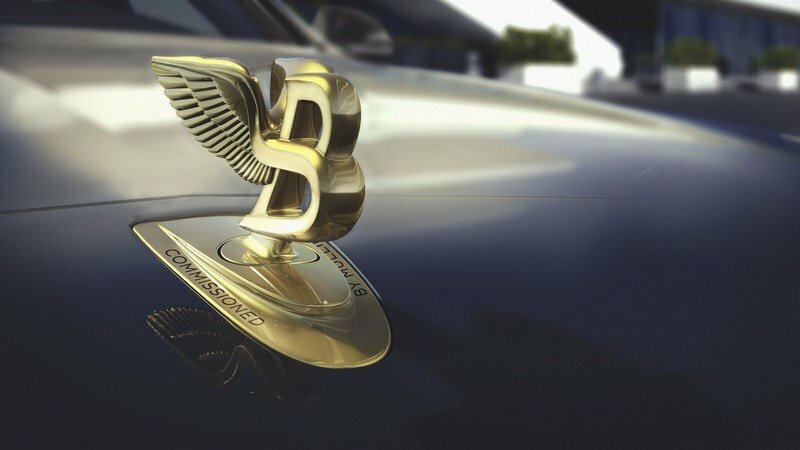 Bentley Motors is today unveiling the Mulsanne Hallmark Series by Mulliner – a highly exclusive limited edition inspired by the finest precious metals and luxury materials used by the very best jewellers.